A motoring icon yes, but surely one that’s close to its sell-by date? These days the Jeep Wrangler wouldn’t look out of place in a museum rather than a new-car showroom. The ride and handling, the design, space and materials of the cabin, the versatility of the interior — all are woeful when compared to the new breed of compact SUVs. Their practicality makes the Wrangler seem obsolete. But it’s amazingly that doesn’t stop it from selling. People love the car for its heritage, simplicity, ease of modification, and legendary go-anywhere ability. And those attributes seemed to hold true again as we drove the new Wrangler through the bush and veldt of the African nation of Zambia. 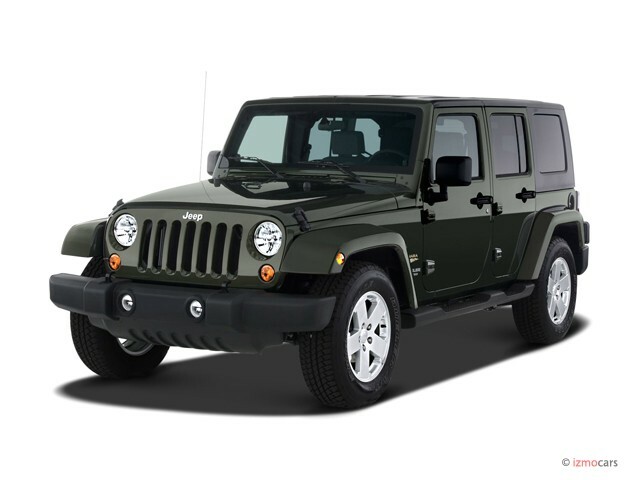 For 2007 the Wrangler has been completely redesigned. A host of major changes, including a four-door Unlimited version and a more user-friendly roof system, have been penned in to boost its appeal. But you don’t mess with success: the external styling is deliberately similar to keep the purists happy. The Jeep grille, round headlamps, exposed door hinges, and fold-flat windshield with rubber stops are all still there. On smooth roads — the few we could find in Zambia — it’s immediately obvious the new Wrangler, codename JK, is a huge improvement over the outgoing TJ. Driving a two-door car, the soft ride and dreadful body roll of the old car are gone, replaced by a feeling that you are actually in a proper SUV. The steering is much tighter, and the vagueness that blighted the TJ, especially in a straight line, has been removed. The 3.8-liter V-6 has that familiar Wrangler hum when you fire it up, but the noise isn’t so intrusive in the cabin. And that’s also true of the tire rumble, which was essentially all you could hear in the old car when doing motorway speeds. 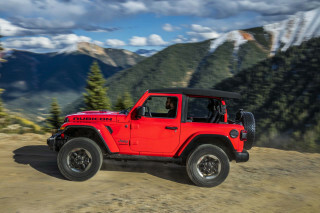 There’s no official 0-60 mph time for the Wrangler or the Unlimited yet, but it’s at least on a par with the 8.8 seconds of the TJ. Top speed has been raised from 108 to 112 mph, and fuel economy for both is around 18 mpg. The new Wrangler’s interior has had the biggest change. It feels like it’s been designed, rather than cobbled together from what was available. Gone is the bare metal in the footwell, complete with ugly welding marks, replaced by proper upholstery. The switchgear is attractive and chunky, and there’s speed-activated central locking and electric windows for the first time on a Wrangler. But there are still plenty of concessions to the car’s tradition; you have to wind down the window and leave a greasy thumbprint on the reflective surface when you want to adjust the door mirrors. In the Unlimited the front section of the cabin is the same, but with a wheelbase that’s 19.7 inches longer the rear is vastly different. There’s a large bench seat and it’s surprisingly roomy. I was expecting it to be cramped, but it’s vast. There’s plenty of knee space even with the front seats right back, and huge headroom. With the two-door car only really a four-seater, the Unlimited can take five in comfort. There’s impressive cargo capacity, too; with the rear seats in place it’s 46.4 cubic feet, but fold them down and it’s 86.7 cubes. The new roof systems are impressive, too. 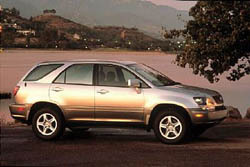 Both the two and four-door cars come with either a soft or hard top. The former is called Sunrider, and has been made easier to use than the fiddly canvas hood of the TJ. It opens to expose the front row seats to the elements (or the second row as well in the Unlimited), then folds back completely. There’s still no solution to the untidy way in which is stores in the boot, though. Freedom Top is the name for the plastic roof, which comes off targa-style separately above each front seat occupant — these can be stored in the vehicle — or can be removed totally. Whichever roof buyers choose, the other one will fit and be available aftermarket. Both are a bit tricky the first time you use them, but infinitely better than what came before. So what about the off-road ability? Surely Jeep isn’t going to get that wrong? During our three-day first drive in the remote bushland of Zambia in eastern Africa, the Wrangler tackled a 300-mile route of smooth tarmac, dust roads, dried-up riverbeds, uncharted grassland and boulder-strewn tracks used only by the local wildlife. There were also several wide streams to be forded, and a ravine so extreme and far from civilization that cars had never been in it before. The latter was a fearsome sight from the top. The route down was a very uneven 40-plus degree slope covered in large loose rocks. The trip out was the same, while the base was a jagged, rocky riverbed with barely a trickle of water and some very obvious crocodile footprints in the sand. Traditional off-road rules would dictate use of the low-range box and first gear, but we would descend too quickly. It was a case of sticking the car in neutral and dragging it down on the footbrake. The Wrangler creaked and groaned in protest, and the scraping on the steel rock rails under the flanks was enough to make you wince. But the Jeep never flinched. Using the low-range box we shunted back and forth to clear tight corners, knocking the front and rear diffs on and off regularly to maximize grip. The car’s new Active Sway Bar System (ASBS) was electronically disconnected via a dashboard button to boost wheel articulation. Getting up and out of the ravine was a case of locking the axles, selecting first, giving it just enough revs to keep going and letting the car do the work. I felt like an airline pilot at take-off, staring straight ahead and seeing nothing but sky. The car performed admirably on what the engineers confessed was the toughest off-roading they’d ever done with journalists. But it’s not without its irritations; all the off-roading switches are very low down on the center console and don’t fall immediately to hand. Jeep engineers admitted their position was a question of compromise, with priority given to the audio and climate controls — sited higher up — because more owners will use them more often. Dynamically the new Wrangler isn’t as good on the tarmac as the class-leading SUVs, but that’s missing the point. It can go where virtually no other vehicle can, and if you want that capability for under $20,000, the engineering has to be a compromise. It now feels like a proper SUV, with road manners that are acceptable and miles better than they used to be.